Encrypt not only file contents but also file paths, sizes, times, etc. 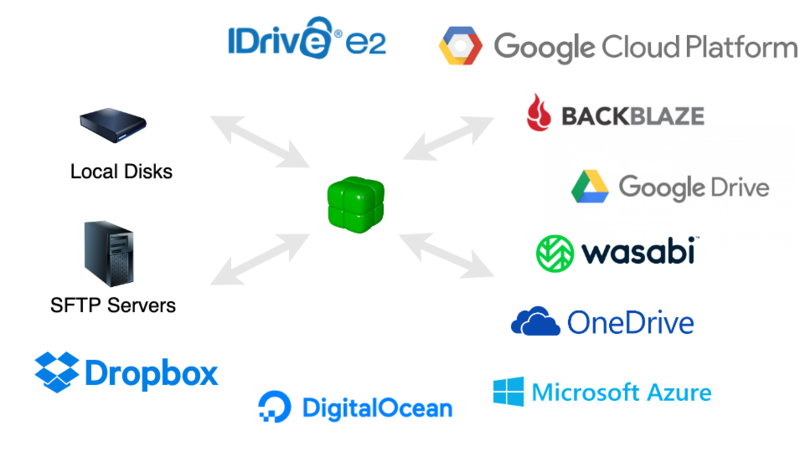 Duplicacy is the only backup tool to support all 7 essential features listed above, because it is built on top of a new idea called Lock-Free Deduplication, which works by relying on the basic file system API to manage deduplicated chunks without using any locks. 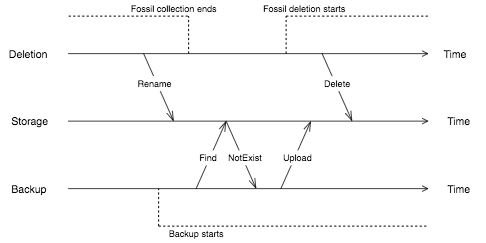 A two-step fossil collection algorithm is devised to solve the fundamental problem of deleting unreferenced chunks under the lock-free condition, making deletion of old backups possible. Thanks to Lock-Free Deduplication, Duplicacy is readily amenable to most cloud storage services without compromising any essential features required of a state-of-the-art backup tool. In addition, Duplicacy also supports local disks and your own SFTP servers such as Mac or Linux computers, or NAS boxes. 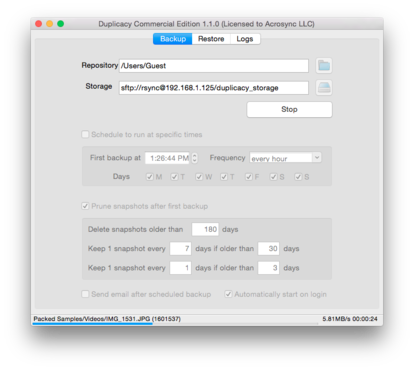 Duplicacy comes with an elegantly designed GUI that features one-page configuration to allow you to quickly set backup scheduling and retention policies. You can also easily configure advanced options such as email notifications, automatic start on logon, and exclude/include patterns. 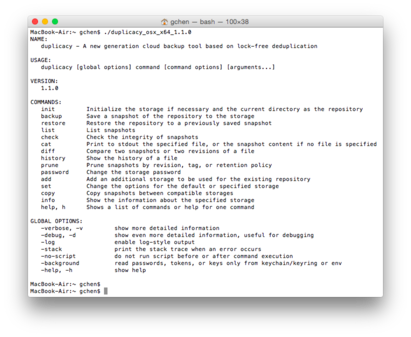 The GUI version is a user-friendly frontend to the Duplicacy backup engine which can also be invoked from the command line. To fully exploit the power of Duplicacy, you can run the command line executable either manually, or from a script for more flexibility. Many features such as adding additional storages, copying backups from one storage to another, changing encryption passwords, are only available in the command line version. 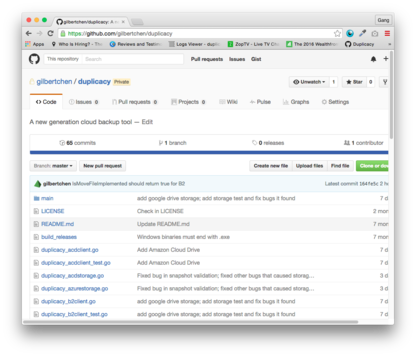 The source code of the command line version of Duplicacy is released on our github page. With source code access, you will have a better understanding of how Duplicacy works internally, and be confident that your backups will always be kept safe and never fail. You can also make customizations or even add new features on your own to fit your needs. The command line version is free for individual users, and commercial licenses can be purchased at a low cost of $20 per user per year. 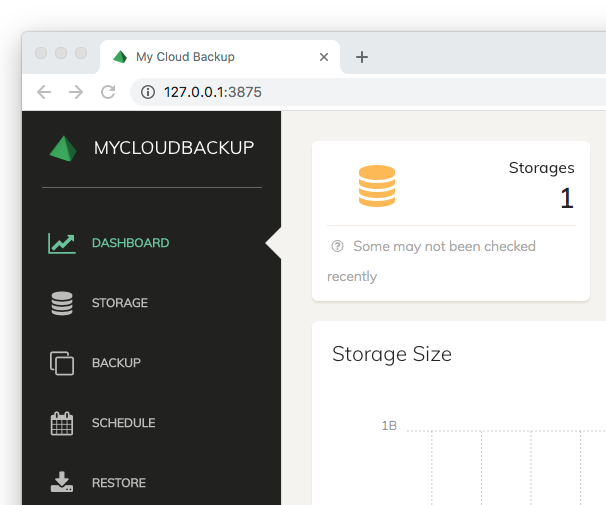 If you are an IT service provider offering managed backup service to your customers, we can build a customized GUI version of Duplicacy that has only your logo and brand name, at no extra charge (if you can commit to 50 licenses in 6 months). It can also be modified to have a pre-configured storage with credentials automatically populated. If you are interested in this option, please contact us for more details.